Evgeny Golubev - I'm generally drawn in by prolific string quartet composers (e.g. Shostakovich, Milhaud, Villa Lobos), and Golubev wrote a heaping 24(!) of them during his career. As well, he wrote a small pile of piano sonatas. What little I've heard of his work sounds very good and I would love for more of it to come to the surface. Kara Karaev - He's an Azerbaijani composer who wrote a lovely set of 24 piano preludes and a lot of symphonic music. I don't know much else about his work. Vladimir Fere - I'm not sure if he's Kirghiz by birth, but this composer contributed to writing Kyrgystan's national anthem and collaborated on several state-supported operas in the Central Asian part of the USSR. I have a few scores from him (piano sonata, violin sonata, and pieces for cello/piano) that are very interesting works. Alexander Mosolov - Like many, I know a lot about his earlier avant-garde works, including those phenomenal piano sonatas he wrote and his dark futurist first string quartet from 1924. I'm actually curious to hear more of his later works, including his second quartet. I've seen some scores of later works, but the bulk of the work is completely obscured. Mikhail Alekseevich Alekseev - a composer who's a complete mystery to me. I've seen a score of his from the 1960s (Two Pieces for cello/piano) and read about some other scores that suggest that he studied Chuvash folk music. A great site for discovering Soviet music - they have also many others - is Classical music online. Thanks for the link. I think I've visited that site before. They certainly have lots of interesting material compiled, including curiosities like Deshevov's opera. I have 3 CDs of Kara Karayev's Orchestral Music and they are most enjoyable and completely tonal and lyrical. I also have 2 CDs of works by Mosolov which I also like. I also have 3 Piano Concertos and 2 Symphonies of Golubev which are tonal and enjoyable. I'd be interested in any of those things if the posting them fits with the rules of the forum. Otherwise, I'll search for the actual discs. Evgeny Golubev - I have quite a bunch of his music, i.e. Symphonies Nos. 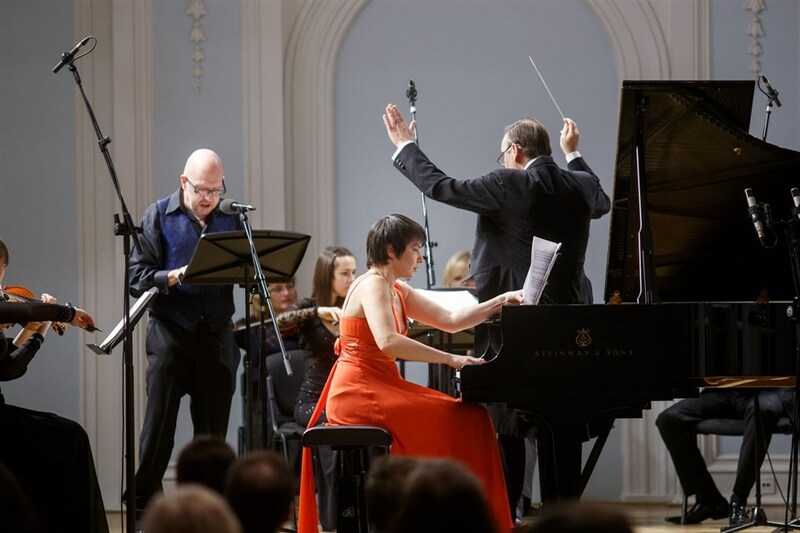 5&7, Ukrainian Rhapsody, Piano Concertos Nos. 1, 2&3, Violin Concerto, Cello Concerto, "Return of the Sun" Oratorio, Piano Quintet, Harp Quintet, String Quartets Nos. 4, 10, 11&15, Cello Sonata, a Song Cycle and some Piano Pieces, among the Sonata No. 4. Several of these works have appeared on CD (mainly PC #3 & Piano Sonata #4, Cello Concerto, the two quintets and SQ #4). He was a student of Myaskovsky and I think there are some echoes of his teacher's music in his own profound and well-written output (though he was also interested in impressionism and went further in terms of style). Qara Qarayev - I have his Symphonies Nos. 1&3, his Violin Concerto, two Ballet Suites, some other orchestral works and a Violin Sonata. There is quite a cut in his output in the 1960s, when he became interested in modern techniques. For example, his Third Symphony and Violin Concerto work with dodecaphonic techniques. Vladimir Fere - I don't have anything by him, and I don't think much was recorded. Alexander Mosolov - in fact, I know some of his later pieces. They are much more conventional than the early ones of course, and honestly not very interesting - not because they are conventional (there were many Soviet composers writing in a traditional idiom who composed music well worth listening), but because they are not very inspired and appealing. I must admit I regard his later pieces as below the Soviet average. There is a very lengthy and thin E Major Symphony on disc, for example. I do have the Second SQ but it comes from CD. Mikhail Alexeev - nothing by him in my collection. There were really thousands of Soviet composers, and thus gaps in the recorded repertoire are inevitable. There were really thousands of Soviet composers, and thus gaps in the recorded repertoire are inevitable. I hope you'll excuse an anecdotal remark made by Rostropovich on that point? "Life was, in fact, very easy for a young composer in those days in the USSR. One only had to go to the Cultural Committee and say one intended to write a grand oratorio entitled "Lenin In A Hut"... and - whoosh! - they gave you a cash advance for the work, and year to complete it. How could they possibly refuse? So composers spent eleven months spending the fee, and then a final month writing the oratorio. On the due date, they took the manuscript to the House of Composers, and collected the balance of the fee. The House of Composers then took the manuscript, and buried it in a cellar unperformed. I often wonder where all that sh*t is now?" Soviet music is probably the field of music about which I know most. I have been collecting Soviet symphonies for years, and according to Mike Herman's online list, there are less then 15 items which I still miss, plus a bunch of works which haven't been commercially recorded. In other words, I have several hundreds of Soviet symphonies (probably about 700) in my collection plus a large amount of other works, including further orchestral works, vocal symphonic pieces, chamber and piano music. Believe me - the overall quality of these pieces is surprisingly high. Of course, there were political circumstances which had their impact, but I also think this is often overrated. For sure, in Stalin's last years, the freedom of composers was most limited, but it also has to be said that in the 1960s, a lot of composers started to try out new paths, did their experiments and so on. Others remained within a more traditional framework - no problem, I think that's the music they just wanted to write. In any case, I doubt whether we should really watch Soviet music as a result of party directives only. Quite on the contrary, I am convinced that we should take the creative output of many Soviet composers absolutely seriously. These were composers who had their own aims, who loved music and composed because they had something to say. I know Rostropovich's statements, I also have a book by him, however as much as I admire him as a cello player as much I am doubtful about how much his views on Soviet music really help. For sure, he was biased as well, and some of his claims are not fair in my view. Actually, the best way to come nearer to Soviet music is first and foremost to take the works as what they actually are, and that's music. So, my opinion is that it is really rewarding to leave the political background completely aside once you get to know a piece of Soviet music and just to concentrate on the piece itself. The political background can come thereafter, if necessary. This way, you'll discover a magnitude of great music. At least, this is how it worked for me. Actually, the best way to come nearer to Soviet music is first and foremost to take the works as what they actually are, and that's music. Oh, I agree with you! And I am often involved in performances of this repertoire here in Moscow Our orchestra* has been active in performing 'socialist realist' pieces by Schedrin, Muradeli and others who've fallen out of fashion in today's Russia. Even so, I would stick to my point that the ethos under which this music was created cannot be entirely divorced from the historical circumstances of its composition. For example, we gave the first post-soviet-era performances of Schedrin's opera "Not Love Alone" ("Ne Tol'ko Liubov") a few years ago, for Schedrin's anniversary. It's impossible to stage a work like that without reference to its historic background - the story of a female Collective Farm director, who falls in love with a capable but unruly farm worker who will not obey the rules, and thus she has to fire him. More pertinently, I was engaged as the stage director for a project to stage Muradeli's THE GREAT FRIENDSHIP - contrary to rumour, the entire score and materials are still in the archives, although it's never been performed. However, the Ministry of Culture torpedoed the idea, and Muradeli's masterpiece remains on dusty shelves - for entirely political reasons. Your point about dividing-off the Stalin period (up to 1953) from the later soviet era is well made. Although the USSR lapsed into economic torpor once again under Brezhnev, the ferocity with which censorship and artistic control were applied in that period can't be compared with the Stalinist era - I suspect, perhaps, because nobody cared so much any longer? Very interesting to know about your performing and staging activities. I would agree that especially in case of opera, the confrontation with the political background can be inevitable for the reasons you give. The Stalin period was unique in Soviet history indeed, and if there was a period of Soviet music in which we can really talk about a strong tendency towards musical uniformism then I'd point out the five years from the 1948 decree until Stalin's death in 1953. Still, we have an astonishing amount of good music composed at that time. Afterwards, the situation changed - how quickly this happened seems to depend on which composers we talk about. In any case, I would say that especially the 1960s provided an influx of many new aspects. In this context, your point about the low influence of the changing political climate of the Brezhnev era on music is absolutely right, and quite interesting. The other thing which strikes me is that I wonder whether there is any Soviet composer who substantially changed his style around 1990 - the only issue I note is that some composers began to develop a keen interest in religious pieces, but I couldn't point out somebody who really made something different afterwards. I will certainly upload some more pieces from my Soviet collection in the future. What I might do now or in nearer future is sharing the links I already provided on Unsung Composers in the past, so that people who haven't had the chance to track them down yet can do so. It's an interesting question! You would expect there 'should' be such a composer, but in reality it's hard to find one? I think there are several factors which explain this absence, though? Firstly, as you already eloquently expressed, there was not such 'tight' repression in place, and already from the Gorbachev-1980s there was little effective censorship (witness, for example, the 'ban' on music by Richard Strauss etc was lifted, Wagner operas were performed again etc). Secondly most of the composers were taught by the composers of the previous generation, with no new influx of new traditions. (It's surprising, for example, that few classical music lovers in Russia today know much about Boulez, Messiaen or Stockhausen). Thirdly, already from the late-1970s composers had been emigrating to other countries if they thought they would have more chance for expression there. Those who didn't were - mainly - in well-paid conservative jobs as directors of institutions (for example, Boris Tchaikovsky) or opera-theatres, who realised their work might be unwanted abroad anyhow. I think the real 'change' in the 1990s was the number of composers 'from the wrong side of the tracks' who came into acceptance - who might otherwise have continued to exist in an underground hinterland they accepted as the 'price' of their artistic freedom. For example, Sergey Kuryokhin - a classically-trained pianist who'd had a rock-music career - began serious projects like 'Art Mechanics' which might have been vetoed before. Sadly he died in 1996 before the project got very far If the USSR was unaccepting of non-tonal music, then it was even more unaccepting of avant-garde and experimental projects like Kuryokhin's. For an example of his 'serious' music, listen to the soundtrack for the film "Mr Designer" (Gospodin Oformitel), made in 1989. The other problem was that funding for music of all kinds dried up in the 1990s, so the great projects which 'ought' to have happened after the USSR imploded either never happened at all, or happened in underground clubs and basements like Tam-Tam in SPb - of which no record now exists Although the 90s ought to have been a time of experiment and freedom, in reality they marked a severe retrograde step into conservatism in all areas of music... rather typical for a period of economic crisis, when people reach out to the known and unchallenging. Thus all the soviet operas disappeared from the repertoires of Russian theatres (Rozhdestvensky famously losing his job at the Bolshoi for daring to stage Prokofiev's THE GAMBLER), to be replaced by a diet of ONEGIN, TRAVIATA and CARMEN. Post-1990 composers have also struggled to write in new genres which didn't exist in the USSR - notably musicals. Serious composers have put their pens behind new works, but I can't say that the results have been very good - mostly they resemble pseudo-Sondheim I wish they would stop aping Broadway models, and write with the conviction of their own style? It isn't entirely gloomy, though - there have been post-soviet masterpieces in a clearly post-soviet style... the best of which has probably been Desyatnikov's ROSENTHAL'S CHILDREN at the Bolshoi - a work which they mysteriously refuse to tour abroad? I agree with this sentiment. I've not yet studied any works in which I've actually felt the socialist realism that is so often derided in works from that area and time. While I have no doubt that composers and musicians living under Stalinism worked under some horrible sociopolitical realities, I'm not going to let that teach me to dislike music that simply pleases my ear. The fact that Paul Hindemith worked in Germany during Hitler's reign has similarly not stopped me from enjoying his wonderful musical output. I've lately been studying a number of piano prelude books from Soviet-era composers like Eduard Abramian, Kara Karaev, and Shostakovich, and all of them have been enlightening. As well, I recently acquired a book of cello/piano pieces by Mosolov, Fere, Alekseev, etc... (the reason I asked after them) and all of the pieces just happen to occupy an idiom that works for my musical sensibilities. I'm planning on digging deeper and seeing what other composers I find. As a sidenote, I actually prefer the general output of Soviet composers to that of America's high-and-mighty classical music community (especially post-1945), which at this point seems to be building a legacy of bankrupt orchestras, widespread tastelessness, excessive patronizing of audiences, avant-gardism going in circles, and legions of tenured composers who nobody amongst our Randian 'capitalist' public cares about. Hindemith didn't stay in Germany long after Hitler came to power, and he never espoused Nazi beliefs to my knowledge, and the Nazis couldn't decide whether he was "degenerate" or the "hope" of the Third Reich's German/Aryan music. His wife was part Jewish, and that is partly why he emigrated, first to Turkey, then in 1940 to the United States where he eventually died--he is one man who truly followed his conscience. However, I can say that I like the music of, among others, Max Trapp and Hans Pfitzner very much, though they seem to have been deeper in the Nazi lifestyle. 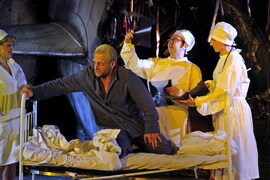 Then, moving to consider France, I love Florent Schmitt's music, though in 1933 he is said to have interrupted a concert of Kurt Weill's music by shouting "long live Hitler", and was part of the marginalization of some of the German refugee composers, such as Alfred Tokayer, who were fleeing the Third Reich via France. In fact Tokayer, among others was denounced by the French, deported from France and murdered in Sobibor in 1943. But I have to say, Hindemith, for his actions seems a hero to me (and I have never heard a note of his music I didn't enjoy). I wonder what I would have done myself in those awful circumstances, would I have been brave, or would I have been expedient? As I look back at my own life, I see moments of great bravery, and other moments of great cowardice, so I just don't know how I might have behaved. It all comes down to the flawedness of humanity, I suppose. Yet, of course, some quite flawed humans have produced art and music so sublime one can barely take it in in its magnificence. I've not yet studied any works in which I've actually felt the socialist realism that is so often derided in works from that area and time. 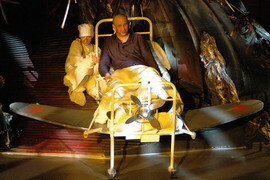 While you are mining Prokofiev's operas for soviet realist content, try POVEST' NASTOYASHEGO CHELOVEKA (aka "Story of a Real Man") - an operatic interpretation of the life of a USSR WW2 fighter pilot who was shot down over no-man's-land, crawled back through the lines, was rescued by partisans, fitted with prosthetic legs, and returned to active service. The final scene shows a Great Leader (who is, of course, Stalin) visiting the pilot in his rehabilitation clinic after the war, giving him a medal and awarding him an apartment of his own. As I said above, I think it's a mistake to label this music 'bad' or 'wrong' - it was written for different ends, for a society radically different to our own. It (often) achieves those ends very successfully in its own terms, even if we find the result unpalatable or naive by our own different standards. In point of fact there have been recent attempts to 'rehabilitate' some of these socialist realist works. Helikon Opera here in Moscow created a staging of Story Of A Real Man for the 60th Anniversary of the end of WW2. Although the plot was largely left intact, the final scene was entirely altered - since a contemporary Russian public would not brook the eulogy to Stalin at the end. Instead of a Leader, a German journalist visits the pilot in his squalid hospital, to interview the legendary WW2 "ace" who is forgotten in his own country and dumped in the corner of a ward. The point was not only to find a more 'acceptable' ending, but to make a political point - about the scandalous treatment of Russia's disabled ex-servicemen. I was at the opening night, and there were nearly riots - which were quelled when a war veteran in the audience stood up and said "be quiet, all of you! this is our story, it is about our sacrifice! ".